Ever considered driving overland from Europe to West-Africa by yourself? To most people, this is an extraordinary thought. Others may have this plan on their ‘to do’ list and for different reasons didn’t execute the plan. Having done this trip four times and currently planning the next one, it inspired me to share my experiences in this series of articles. It is not so much a travel journal but merely a guide for those who are interested in this subject or who are actually planning such a venture. Before leaving, you will have to make a couple of decisions I want to discuss here. Are you going to travel alone or with a friend(s) or do you even prefer an arranged group travel? I always travel alone for obvious reasons. You can travel at your own pace and visit places that have your interest only. You are more open to contact people and more approachable to others you meet on the road. Difficult or even crucial decisions can be made by your own judgement. This of course is a very personal choice and none of the other options can be wrong. Do expect long periods of time where you will find yourself completely alone in the desert. That depends on what you are planning to do. Do you plan to sell the car in Africa or do you drive it back home. In the case of selling the car, there are a few things to consider. For instance, the car can not be older than eight years when selling your car in Senegal. In fact, a car over eight years and older is restricted to enter Senegalese territory. 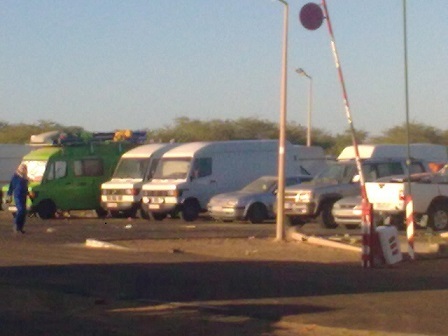 However, a special procedure does exist for ‘overage’ cars to enter Senegal with a Passavant de Circulation. This procedure will cost you 150 euros and you will be accompanied by a Senegalese customs officer until the border with The Gambia. The whole idea is that you not illegally sell the car in Senegal. It often happens you meet up with other overlanders at the border. You can drive with two cars through the country accompanied by one customs officer. This way you can divide the amount to pay for each car. Unfortunately, what you always thought about corruption in Africa will be confirmed at this very border. More than once, I have seen travellers who wanted to cross the Senegalese border paying huge amounts of money. The ‘Passavant de Circulation’ is meant for temporary importation of vehicles with suspension of duties and taxes. For definite importation of your car into Senegal, read the article ‘How to import a car into Senegal ‘. Another thing you may assume is the need for a four-wheel drive car (4×4). The answer is no. Until The Gambia, you will mostly drive on tarmac surfaced roads unless you decide to leave the Atlantic Route to drive ‘off piste’. There’s one exception, a section of no man’s land between the Moroccan and Mauritanian border. A sandy, rocky track stretches out over roughly 2000 meters. With precautions this small track is achievable. However, due to past conflicts, land mines are still sitting around in this desolate place. Warning! Do not leave the ‘piste’ between the two borders under any circumstance! Four wheel drive cars are very popular in the region which makes them relatively easy to sell. The same applies to minivans. Almost without exception, once purchased, they will serve as a taxi in a new life. Generally, sedans do sell better than station wagons and a manual gearbox is more popular than an automatic gearbox. Senegalese customers have a preference for French made minivans. 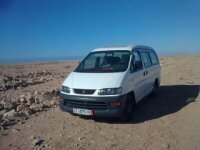 In The Gambia they are less picky, although French minivans are a bit rare. As a rule, don’t spend more than 1800 euro’s on a minivan. Anything above that figure and you may struggle to recoup your investment. Avoid petrol driven cars or right hand driven cars. In this part of Africa, diesel cars will sell and they will be much more economical for you to drive as well. Do you need a car with air conditioning? Again, the answer is no, but air conditioning does have its merits. Temperatures in the Sahara desert can raise up to 40 degrees Celsius! I once had to help a British overlander who got caught by the heat. I found him exhausted, standing still in the middle of the road, with the engine still running. His small car didn’t have A/C. Also, it is a good selling point for luxury cars but not for minivans. Once converted to a taxi, for economic reasons, the air con will never be turned on by local drivers. Be sure to use a mechanically good car with a valid MOT to cross the desert. If the MOT has expired, you will not be able to insure the car. More about preparations in the next part of this series.